The Gowanus Canal Conservancy (GCC) has announced the launch of Gowanus Lowlands, a new comprehensive vision for the transformation of Brooklyn’s Gowanus neighborhood and a ‘blueprint for NYC’s next great park.’ As 6sqft has previously reported, between developers eyeing the pricey parcel of southwest Brooklyn land as Paris on the Gowanus and the city’s ambitions to transform the long-embattled area into “Little Venice,” all eyes have been on the neighborhood and the once-toxic, steadily improving Superfund canal that anchors it. With an important rezoning on the horizon–the process kicked off last October with meetings to gauge community opinion–passions are running high. 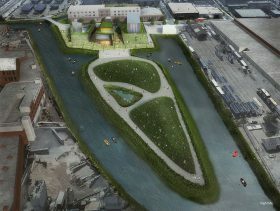 The conservancy has identified SCAPE landscape architecture studio to guide the Lowlands vision toward reality.